2. Login/Sign up with Nearbuy. 3. Now, look through all the parties available in your city. 4. Select your favorite one and proceed to buy. 5. Enter your Name and email id. 6. 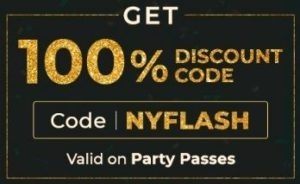 On the payment page, apply promo code : NYFLASH >> Complete the payment with any suitable method. 7. Voila!!! Enjoy your eve. Party hard. Coupon code valid only on 31st December before 7PM. discount code of 100% (up to Rs 750) will be added within 24 hrs after redeeming the deal. Discount code received can be applied on your next purchase of Rs 1500 and above. Discount code will be valid for 2 days from day of issuance.